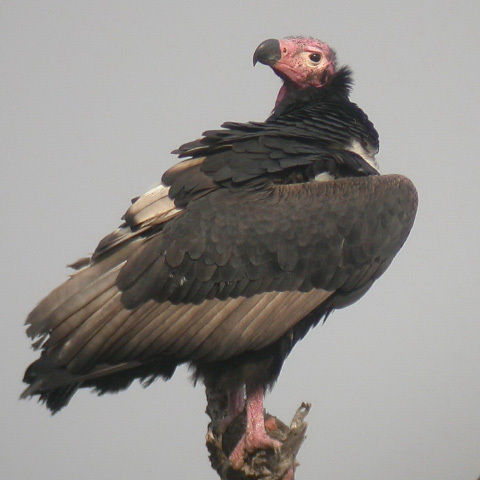 A captive-breeding program has been instigated at the Cikanaga Wildlife Center, although the theft of three individuals in organised raids in 2014 set back development of the programme (Tritto and Sozer 2014). This centre holds the only known individual of the slamatensis subspecies, which may be extinct in the wild (S. Chng in litt. 2016). 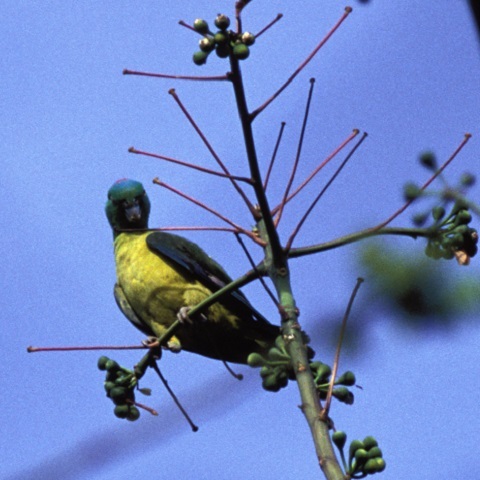 The species is known to persist within one protected area, where it is regularly observed along a single trail. It is hoped that the groups present there are not accessible to trappers. Survey strategically across the remaining montane forest habitat to attempt to locate further persisting populations. 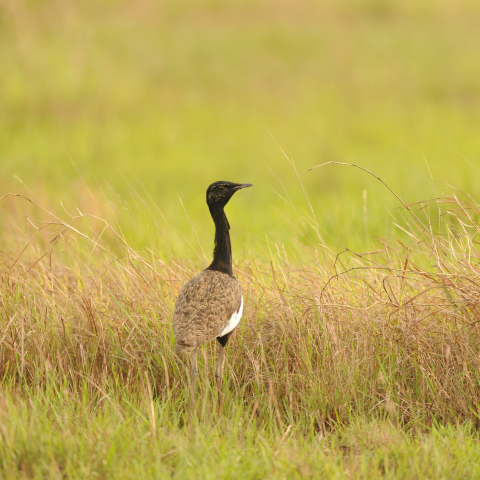 Monitor its presence in bird markets within the region, as well as population and habitat trends across the range. Campaign for the legal protection of this species and controls on rates of trapping. Conduct education and awareness-raising activities to discourage trapping. Encourage livelihood alternatives in selected communities to reduce trapping pressure. Test the feasibility of more ecotourism within the species's range, with increased community engagement. Garrulax rufifrons is restricted to the mountains of western and central Java, Indonesia. Formerly common within this range, it is now uncommon in many areas as a result of trapping for the cage-bird trade. The only reliable site now appears to be Gunung Gede-Pangrango, as it no longer occurs in many accessible areas where it was once common, such as Halimun-Salak National Park (Shepherd et al. 2016, J. Eaton in litt. 2013). The subspecies G. r. slamatensis, which is thought to be restricted to Mount Slamet, has not been observed in the wild since 1925 (Shepherd et al. 2016), although it does persist in captivity (S. Chng in litt. 2016), and surveys that failed to find the species in 2013 on Mount Slamet did take place mostly above the altitude limit of the species (Mittermeier et al. 2014), so it is possible that the subspecies persists in the wild. The global population size is estimated to number fewer than 250 mature individuals, based on the highly restricted distribution and lack of recent records, including at market surveys throughout Java (Collar and van Balen 2013, Eaton et al. 2015, Shepherd et al. 2016, S. Chng in litt. 2016, J. Eaton in litt. 2016, A. Owen in litt. 2016, A. Tritto in litt. 2016). Numbers observed in the market are now very low indeed, and some may be from very limited captive breeding (or stolen from captive breeding efforts): three were recorded in a survey of Jakarta's markets in 2014 (Chng et al. 2015, Shepherd et al. 2016) and four in 2016 (Nijman et al. 2017); one was observed for sale in Surabaya in June 2015 (Chng and Eaton 2016, Shepherd et al. 2016); one in Tasikmalaya in 2016 (Nijman et al. 2017); and four have been reported in Bandung in 2016, on two dates (A. Tritto in litt. 2016). 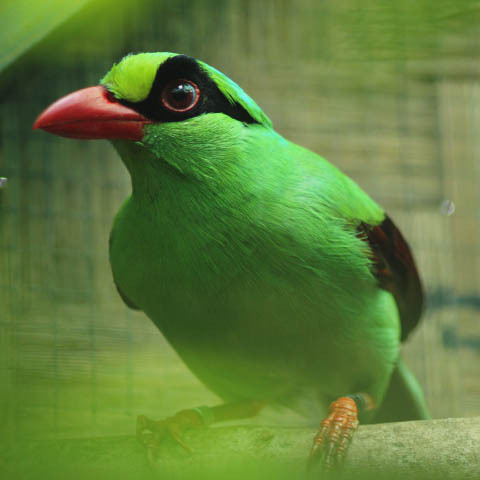 This species is heavily exploited as a cage-bird, which appears to have caused the disappearance of the species from much of its former range: short surveys in Halimun-Salak and in four areas of the Bandung mountains in 2014 failed to locate the species (A. Owen in litt. 2016). Demand for the species appears to remain high as when the Cikanaga Breeding Center received information of the presence of three individuals in the market at Bandung, two had gone by the time they arrived (A. Tritto in litt. 2016). Its forest habitats do not appear secure from the threat of trade as extensive trapping has been observed throughout mountains in Bandung (A. Owen in litt. 2016). Additional potential threats are posed by the impacts of projected climate change and volcanic activity, such as on Gunung Merapi, where the species may occur (Yong Ding Li in litt. 2012, 2013).